Stem cells are the ‘basic cells’ of our bodies, which can develop and differentiate in any type of cell. These cells migrate to injured areas within the body and get transplanted and transform themselves into new tissue cells that replace the damaged ones. Stem cells have the capacity to multiply and renew themselves almost indefinitely. Stem cell can form nerve cells, muscle cells and blood cells which cannot multiply themselves and have limited life spans. Stem cells are the foundation cells for every organ, tissue and cell of the body. Thus, first stem cells originate within the developing embryo. 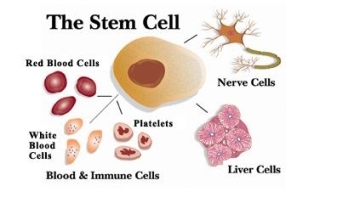 Stem cells from the bone marrow can develop into cardiac muscle, as well as liver, brain, nerve, fat and skin tissue. These cells are progenitor cells that lead to creation of new cells and are thus called as generative cells. 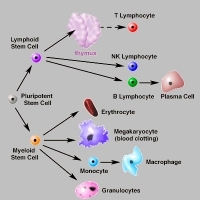 Haematopoietic stem cells are found in the bone marrow and give rise to all the blood cell types. 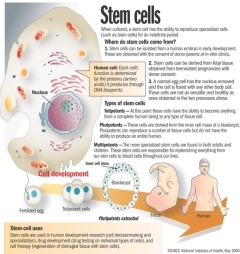 The two broad types of mammalian stem cells are: embryonic stem cells that are isolated from the inner cell mass of blastocysts, and adult stem cells that are found in adult tissues. In a developing embryo, stem cells can differentiate into all of the specialized embryonic tissues. In adult organisms, stem cells and progenitor cells act as a repair system for the body, replenishing specialized cells, but also maintain the normal turnover of regenerative organs, such as blood, skin, or intestinal tissues.